WASHINGTON — In a moment that shocked many Americans, a member of Congress has been arrested for being exactly the person America wanted her to be. 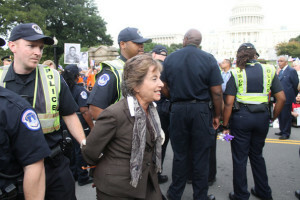 Representative Jan Schakowsky (D-IL) was taken into custody Tuesday afternoon for being far too respectable. According to police reports, after Schakowsky woke up, she made coffee for her husband, read the newspaper, and fed her dogs. During her drive into the city, she slowed slightly to give a merging car room to enter her lane. After generously tipping a valet, Schakowsky held the door open for an elderly man and chased after him when she discovered he had dropped his handkerchief. As soon as she joined a peaceful rally supporting immigration reform, a cause that the overwhelming majority of her constituency supports, security knew they had to intervene. “The situation was getting far too out of control,” explained the Head of Congressional Security Ron Mullins. “Congresswoman Schakowsky was completely disregarding the ramifications of her actions. Members of Congress are expected to comply with the long-upheld standard of doing nothing right.” Mullins conceded that reading the newspaper was a petty offense, but needed to be dealt with when taken in context with her larger infractions. Speaker of the House John Boehner expressed concern over Schakowsky’s actions. He explained that if some politicians begin to hold the same moral code as their constituents, all politicians will be expected to act according to such standards. “We simply can’t allow the American people to form those kind of expectations,” he announced while warming his hands over a burning copy of the Affordable Care Act. The total lack of response from Rep. Schakowsky’s office suggests that her staff has renewed its dedication to the Congressional Code of Ethics.